New research has shown that toddlers shown “educational” DVDs – popular with pushy parents keen to give their toddlers’ a head start – actually have worse vocabularies than children who didn’t. 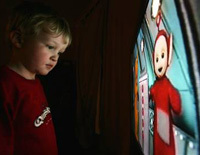 Far from boosting IQ, they appear to hamper learning, according to a team from California University who carried out a study of almost 100 one- and two-year-olds, using an £18 DVD from the Baby Einstein range. Face-to-face time with parents appears to be far more stimulating, a view recently echoed by the Jean Gross, an educational psychologist and the government’s first “communication champion”, who admitted that middle class children are struggling to communicate because working parents are unable to spend enough quality time with them, read them bedtime stories or eat meals with them. “Our brains have not evolved to learn from machines; babies are primed to respond to a face,” says Gross. According to speech and behavioural expert Sioban Boyce, the middle class preoccupation with hothousing and speaking to little children as though they were adults is not simply a bit pretentious, but downright harmful. “Increasing numbers of parents are deciding not to 'babify’ their babies, which is just as contradictory as it sounds, and is storing up trouble for the future,” says Boyce, a former NHS speech and language therapist and author of Not Just Talking, a parent’s guide to helping babies communicate from the moment they are born. There are sound scientific reasons why we’re programmed to speak to our babies in exaggerated intonation pattern known as motherese. Ironically, this way of verbalisation is the only way they can learn to recognise and understand non-verbal communication, which accounts for between 60 %and 90 % of any conversation. “By understanding big expressions, where we elongate vowels, make noises and adopt a sing-song tone, babies learn to 'read’ our faces and body language and understand what we are trying to convey, whether that’s excitement or anticipation or sadness or anger,” says Boyce, herself the mother of three boys. In adult interactions, or on television, the social signals are so subtle that a child can’t read them. Without this foundation, he or she will go on to have great difficulty being able to interpret the unspoken cues we take for granted, which can be as diverse as a frown of disapproval or an interested nod.